Tierra Del Rio is a wonderful Glendale community nestled between the Agua Fria River to the West and Sonoran Desert to the North. This newer neighborhood built entirely of Pulte Homes is located just 15 minutes from Lake Pleasant Park, making this subdivision great for those who love recreational sports. 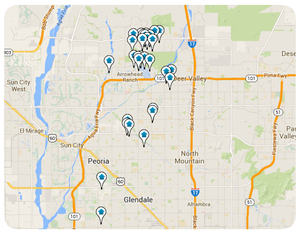 Conveniently situated just minutes from the 303 and 101 freeway, commutes anywhere in the valley are made easy.